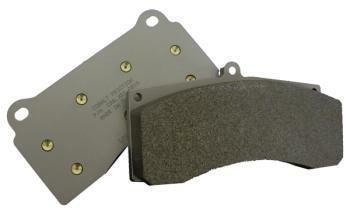 Cobalt Friction Brake Pads - XR1 - Dezod Motorsports Inc - Home of the automotive performance enthusiast since 2002. Cobalt Friction XR1 Brake Pads combines a very aggressive initial bite/attack and high sustained torque levels with good modulation/threshold control and release characteristics to deliver unparalleled decelerations rates across a broad range of operating conditions. Cobalt Friction’s proprietary Thermo-Velocity Design Profile yields unmatched consistency and torque stability across an extremely broad temperature range, throughout the life of the pad material. Unmatched disc & pad finish/wear for this level of performance. Equally well-suited for vehicles with active aerodynamic profiles as well as limited downforce applications due to the direct line pressure to generated torque relationship. Sports Racer – IMSA Lights, SCCA ASR, CSR, DSR, etc. Formula Car/Open Wheel – Indy Lights, IndyCar, Star Mazda, etc.